Albert Einstein molded the field of physics as we know it with his laws of motion. Benjamin Franklin revolutionized how people viewed electricity with his kite and key in a thunderstorm experiment. And then, of course, there’s Henry Ford whose combination of business knowledge and creativeness drove the American transportation industry into the future. Much like the old adage “if you’re not moving forward, you’re moving backward,” the key to advancing society is innovation. And, like the thousands of scientists who came before them, Einstein, Franklin and Ford’s feats were stepping stones to bigger and better things. While innovation in transportation started long before Ford, he pushed it to another level; didn’t stop there. Since Ford designed the Model T and introduced the assembly line to his plants, there have been many advancements in engines, parts, accessories, fuel usage and technology. That’s where we come in. As an enterprise software company that provides solutions to the transportation and logistics industry, we strive to create products that not only fit the needs of our customers, but also transform the way the world moves freight. However, we can’t do that without our customers. 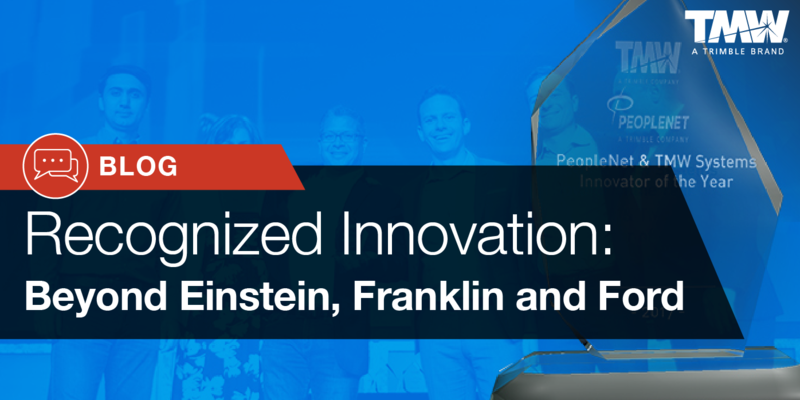 So, we would like to take this opportunity to further recognize five companies who embody Einstein, Franklin and Ford’s spirit of innovation from among our 2017 Innovator of the Year award winners. Since 1979, Ontario, Canada-based company Traffix High Performance Logistics has been providing load broker and third-party logistics with a high level of customer service to the transportation industry. As the business continued to grow, company management realized that their customer relationship management (CRM) software wasn’t keeping up with their sales team’s increased workload. Previously, Traffix had a manual process to handle customer/vendor profiles that included copying and pasting information from different places and sending it to different departments. While a move to an automated system was necessary, the company’s leadership also knew from past experiences that user adoption would be one of the main challenges of changing CRM systems. Rather than searching the market for a cookie cutter CRM platform to fits its needs, Traffix worked with the development team at TMW, along with key stakeholders and users at Traffix, to innovate and enhance TMW’s Command Center application integration with its TruckMate transportation management solution (TMS) solution. By customizing Command Center, the company’s sales team members gained greater visibility into customer/vendor profiles to increase visibility and accessibility for their sales teams. And due to employees’ familiarity of using other TMW products, Traffix witnessed quick user adoption. By using TruckMate and Command Center, Traffix was able to save operational costs because there was no need to buy third-party software to integrate with TMW. The integration also enabled every department to improve efficiencies and limit the amount of extra work required in their day-to-day jobs. Users no longer have to spend time copying and pasting information into vendor/customer profiles to share information with other departments, which saves time and increases accuracy. Each department is also able to focus on the task at hand. Crestwood Transportation LLC has been serving its customers for more than 25 years by providing safe and reliable transportation of NGL products, crude oil, condensate and water. In 2014, like other carriers transporting energy-related commodities, Crestwood Transportation experienced business challenges caused by weakened demand and downward price pressure, which resulted in underutilized equipment, decreased productivity, and increased costs (driver compensation, equipment lease, and fuel) as a percent of revenue. To overcome these obstacles, Crestwood Transportation implemented software solutions from TMW Systems to track data company-wide. Solutions included: Fuel Dispatch, ExpertFuel, TripAlert, TMW Imaging, TMT Fleet Maintenance and TMW BI. The software solutions capture and assimilate data from the different business units, which enables the management team to analyze the information to identify cost savings and operational efficiencies. The results were almost instant. Crestwood Transportation saw benefits in customer service from implementing Fuel Dispatch and ExpertFuel. Also, redeploying the TotalMail solution enabled better communication between drivers and dispatchers, which resulted in cost savings, additional services and capabilities that were passed on to customers. And, while the company has always had a heavy emphasis on safety, the solution provided even deeper insight into driver safety and operational efficiencies, which enabled it to become a two-time recipient of the National Tank Truck Carriers (NTTC) Competitive Safety Award. Armour Transportation Systems is a regional LTL (Less Than Truckload) intermodal carrier based in Moncton, New Brunswick, Canada. A big part of Armour Transportation Systems’ operations relies on tracking information for all shipments. As its business grew throughout North America, it realized that it needed the ability to keep track of larger volumes of freight without sacrificing more time and resources. Previously, Armour Transportation Systems had to move massive amounts of products, scan the packaging label, and wait at least a day for all transactional information to be available. If shipments were late, it had no way of letting clients know the location or estimated time of arrival for freight loads. In 2015, Armour Transportation Systems decided to implement TMW’s TruckMate and ConnectedDock software solutions. The utilization of the solutions helped the company track the status of freight and give its customers the ability to have full visibility of their shipments throughout the entire process. Clients can also create and label the contents of their shipments themselves. By giving customers the option of labeling and barcoding their own packages, Armour Transportation Systems reduced the likelihood of mistakes and mix-ups by its employees. The change enables the company to move freight through its network more efficiently and quickly. Because its customers gained insight on the whereabouts of their shipments, Armour Transportation Systems saw a significant boost in morale and trust between the company and its clients. The number of missed items also saw a significant decrease because TruckMate requires all items to be present before tasks can be completed in the system. For more than four decades, the Cheney, Washington-based company Trans-System has been providing transportation services including flatbed tractors, reefers, and dry and liquid bulk freight. Since its performance is dependent upon the success of its communication and real-time problem solving, many employees were overwhelmed with the vast amount of emails and notifications that they were receiving daily. In its old system, finding the information needed to complete tasks was also a hassle. Managers’ tasks included manually sifting through emails, spreadsheets, and other documents to retrieve information that was immediately needed. One of Trans-System’s main challenges was sitting down with its managers to determine which alerts needed to go to which people and what information was the most valuable to its business operations. A few years ago, Trans-System transitioned to TMW.Suite and TMT Fleet Maintenance to improve efficiencies and problem solving for all three of its companies. The solutions enabled the company to create dashboards for its employees to create customizable alert screens, which allowed them to opt-in or out of alerts that were only pertinent to their job. Also, supervisors were able to use TMW.Suite to create, track, report, and approve payments and billing without the hassle of cross-referencing timestamps and tasks themselves. Since the implementation of these alerts, Trans-System saw an improvement in the level of communications that goes on within its company. In the first year of use, Trans-System’s number of cargo claims dropped by 75 percent, because it was better able to monitor its fleet maintenance and effectively communicate when issues were resolved. Also, Trans-System and its subsidiaries are able to save time and money by assigning tasks to the appropriate members of the team to ensure that everyone is focused on what is important to them individually. Business Intelligence Innovator of the Year: Trimac Transportation Services Inc.
Trimac Transportation Services Inc., which was founded in 1945 and is headquartered in Calgary, is a full-service transportation company that focuses on bulk commodities shipping, logistics, brokerage, loading facilities along with shop and wash racks for fleet maintenance. In the past, the company tried to build its own data warehouse to view metrics and produce reports. The process proved to be time-and-resource consuming and extremely inefficient. The company’s main challenge was to take years of data from different systems and house it in a single system that was easily digestible for all employees. Trimac Transportation scrapped the plan to build its own data warehouse and opted for a solution that would work from day one, right out of the box. The answer was TMW Data Warehouse for transportation data analytics. The software captured data and metrics from the different systems that Trimac Transportation employees use and stored it all in one system. The company then transferred and augmented data from its TMW PowerSuite and TMT platforms, and its mobile communications, HR and financial systems with the data warehouse. Through this process, the implementation team was able to identify important KPIs to manage a successful change management plan. Using good practices, good software and accurate data, Trimac Transportation was able to streamline the data, allowing its users access to what they truly needed to know. Immediately TMW Data Warehouse met 75 percent of Trimac Transportation’s data capture and storage needs. Also, management saw instant success in its process quality metrics. It was able to focus its vision on things that needed attention, which enabled them to improve the business. As a TMW customer, what innovation would you like to share? Stand up and be counted. Download, complete and submit a nomination form for the 2018 in.sight Ovation Awards (formerly Innovator of the Year). Awardees in multiple categories will be recognized in September during the 2018 in.sight User Conference and Expo in Houston. If you would like to hear any of our “2017 Innovator of the Year” award winners’ full story, then please visit here to watch a webinar that details their submission.